The IB program is an internationally recognized pre-university curriculum that offers year 12 and 13 students (or year 11 and 12 in some schools) an opportunity to gain a diploma based on a comprehensive and integrated curriculum that meets international standards. There are currently 1,888 schools worldwide offering the IB diploma programme. In the Asia Pacific region alone there are 255 schools currently offering the IB. The IB curriculum is a fairly traditional and broad based curriculum. There are many similarities to the United Kingdom AS and A2-level curriculums. One major difference is that students must take six subjects over two years in the major academic areas (native language, second language, individuals and societies, experimental sciences, mathematics and computer sciences, the arts). As well as these subjects, students study ‘The Theory of Knowledge’ and are required to complete a certain amount of CAS (Creative Action and Service) plus undertake a major research assignment or extended essay (EE). This comprehensive and advanced programme of study offers students an integrated approach to learning across different academic disciplines. The focus is for students to develop the knowledge and skills needed to meet the challenges of living and working in an increasingly interdependent and globalised society. The International Baccalaureate is governed by the International Baccalaureate Organization based in Geneva, Switzerland and administered by the International Baccalaureate Curriculum and Assessment Centre in Cardiff, United Kingdom. The IB organization originated nearly 50 years ago in Europe. It was created by international schools looking to ensure quality educational standards for students regardless of where they lived or studied. The IB programme today seeks input from educators worldwide to make sure the curriculum is up-to-date, to train the teachers who deliver the programme and to assess students who undertake the program. An IB diploma offers numerous advantages for students. One of the greatest advantages is that the IB was designed to ensure a cohesive and comprehensive education for students. This is still the key objective of the IB. The programme aims to prepare students not just for success in further education but also for success in their future lives. The IB allows students to gain a broad and general education and to postpone some choices about which area they wish to specialise in until a more mature age and outlook is achieved. Students gain a broader view of the world andare encouraged to follow in-depth approaches to academic disciplines. They improve and develop their time management, research & development and problem solving skills. These talents and skills will help students long after they have completed their IB diploma. The CAS allows students to become more community aware and gives them the opportunity to ‘put back’ something to the community they are living in. The IB assessment is conducted over the two years of the programme using internationally-accepted performance standards. Student achievement is assesed in a variety of ways: examinations that are developed and marked by international examiners; oral language exams; science laboratory notebooks and experiments; art portfolios, computer science dossiers; essays and other projects. The student's final score is calculated from a combination of all these activities. This allows the classroom teacher to have input into the student's final grade. 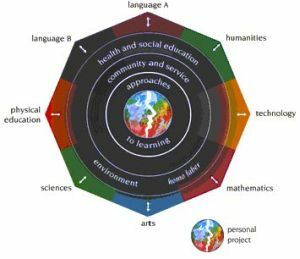 The philosophy underlying the IB assessment process is aimed at giving students the opportunity to express what they do know, rather than finding out what they do not know. The method that is used to achieve these objectives is based on the theory of criterion-referenced assessment, which has both internal (by the teacher) and external (by over 5000 subject examiners world wide) elements, over the two year period of the diploma. All internal assessment is externally moderated and standardized to ensure fairness and consistency. In comparison to UK A levels, Oxford University on its website states that the exam results from the IB will generally be equivalent to the following: grades A, A, B or A, A, A in British A-levels will be considered equal to 38 points in the IB. Cambridge University states that 36 - 40 for the IB is normally sufficient to be considered for most courses. Cambridge also states that for some courses a seven will be required in specific subjects. About the Author: Gary Hadler B.Ec, Dip.Ed, MBA is an assistant examiner for IB in economics and the Principal of ITS Tutorial School.